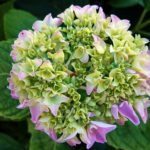 I recently bought a hydrangea. It's in a small pot and I would like to either put it in bigger pot or in a nice spot in the garden. Is it safe to do so now? Also, is it possible to take cuttings to propagate? As long as your last frost has passed, you can plant out potted plants. But, if the temps are now rather high, you may want to wait until fall to plant out.